Culture can be described as the way “people live their lives, the daily or seasonal rituals they observe, and the way they regard the world around them,” (Flora & Flora, 2004). With a small population of less than 10,000 residents (US Dept of Commerce, 2014) and temperatures consistently colder than Burlington, VT, the members of the village of Potsdam must find activities that many people can enjoy and that are appropriate for the environment – the obvious activity being hockey. While this may seem like an insignificant hobby to an outsider, it has come to shape the culture for the village residents. Children begin skating from a young age and often continue to play through high school, and even into college. 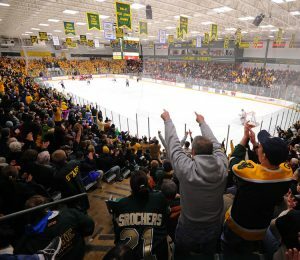 Additionally, Clarkson University has a division 1 hockey team which draws many families in to watch on a weekly basis. Attending hockey games at Clarkson has become a family tradition, as fathers bring their sons like their own fathers brought them. While it may seem unusual that most families partake in these activities the low income the residents are unable to afford more expensive activities like going to concerts (US Dept of Commerce, 2014). This culture is supported by multiple CBOs which offer affordable youth hockey programs. For instance, SUNY Potsdam hosts many youth programs through their CLEAR (Center for Lifelong Education and Recreation) initiative (SUNY Potsdam, 2013). While local culture is strongly routed in tradition and family, it is important to also understand the culture of the thousands of college students that spend a large portion of the year in Potsdam. While all of these students fall under the culture that is typical of being on a college campus, there are also many diverse cultures within the college setting from athletes, to those involved in Greek life, to academics. Flora, J. L. & Flora, C. B, (2004). Retrieved from CDAE 102 Lecture Notes.